Family-owned Printer Celebrates 95 Years! Sharon, PA. – Victor Printing announced it is celebrating 95 years as one of Sharon’s most innovative printers. Since 1919, the family-owned commercial print company has provided customers with high-quality products, unsurpassed customer service and today offers a wide-variety of in-house services. “Being able to adapt to change is essential to longevity and growth,” remarks Bill Richards, “that’s why in the early 80’s we became a trade only printer.”Victor Printing founder, William Victor Richards, started in the printing industry in the garage of his parents’ home in 1919. Today, Richards’ grandsons, Bill and Terry Richards, have continued to grow and expand the business. While Victor Printing remains an expert in printing, they are also a full-service provider offering clients design, commercial and digital printing, forms manufacturing, wide-format, mailing and finishing services. The most significant change Victor has made over the years is the expansion of their capabilities and services related to technology. Business continued to grow and so did the needs of their customers, which brought the inception of digital printing in 2000. Today, large format printing, direct mail services, and a vast array of finishing techniques are among the many technology-related services Victor provides. 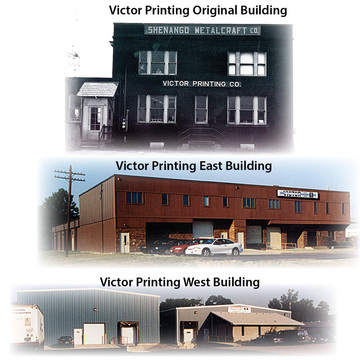 Many things have changed at Victor Printing in the past 95 years of business, but the one thing that remains constant is their goal of offering the highest quality products and services and achieving complete customer satisfaction. « Banners Are Dog-Gone GREAT!